The Addams Family, a tv show that goes way back in cable viewing history, has taken on many forms. Of course, it started as a black and white sitcom of sorts, then was transformed into a movie and a sequel (were there more than two?). But now, it has taken on a whole new face…a musical production on Broadway. One would think that there would be much for theater artists to create, what with the morbidity and dark humor that oozes from the characters. I would picture a dark set with dark props…overall, very dark. Indeed. But what about the characters? Critics who have seen it were let down by the new Broadway show. Ouch. 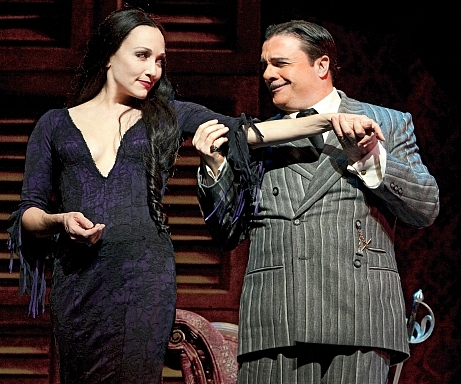 That has to hurt for actors Nathan Lane and Bebe Neuwirth, who play Gomez and Morticia Addams, respectively. Geez, it must be pretty bad to spark such hatred. If you still have the urge to see this musical, be my guest. But make sure you tell us about it. I hear Nathan Lane was the lesser of all evils throughout the entire play. Check out the Addams Family Musical Website for more.